I’m not sure where this idea came from actually. It was so long ago now I can’t really pinpoint it’s origins, but usually they come to me in the shower. Once I had mulled it around in my head I made a quick sketch. This helped me figure out rough proportions and the basic shape I wanted. The next step was to draw a modeled sketch (not sure the proper terminology here). I’m absolutely horrendous at drawing so I downloaded and printed a fashion croqui from Designers Nexus Inc, to trace for the outline of the figure. This allowed me to show the skirt as it would look on an actual person. 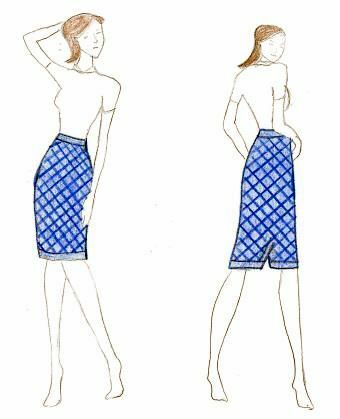 And here you have it, the Helen Pencil Skirt as a fashion sketch. Next up, the submission process.